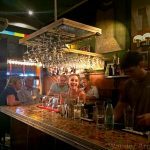 La Carretería is a delightful neighborhood cantina serving up northern Argentine cuisine in San Telmo’s Parque Lezama area. The Andean fare served here originates from Argentina’s northern Jujuy province. 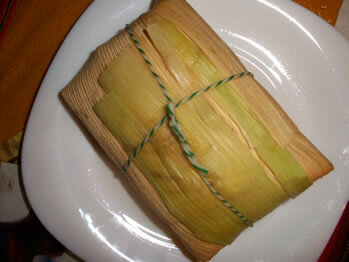 Featured are corn-based dishes including humitas and tamales, sweet corn paste filled with meat or cheese and wrapped up in cornhusks like little presents. 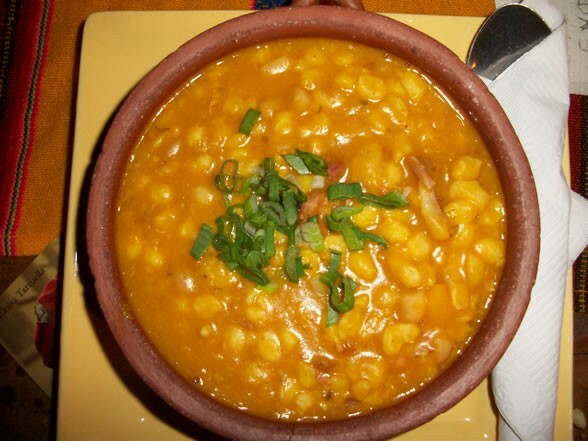 La Carreteria’s also cooks up some of Buenos Aires’ best locro, a hearty corn-based stew with chucks of meat served in clay bowls. ‘The restaurant in the little house used to be nothing more than a tiny tamale hut. It had five tables and Creole guitar players that would stroll through to give impromptu concerts. La Carretería expanded to twice its size a few years ago and is a bit more upscale then it used to be, but it retains its original charm. There are rotating art installations, professional live music, and the tiny declarations, poems, and wishes of customers scrawled on pieces of paper and left under the glass countertops of the tables. Owner, Silvia Moguillansky is a musician who played for 17 years with the Argentine folk band, Ollantay. The group cut five recordings, was featured at the grand re-opening of the San Martín Theater and toured all over South America and even Israel. She met her ex-husband, a native of Jujuy, while on tour. The couple settled in Buenos Aires, started a family and in 1994 La Carretería was born. “At some point I figured I should try to make a bit of money,” quips the folk musician. Today Moguillansky, who lives next door to the restaurant with her kids, is the sole owner. The original idea was to have a neighborhood restaurant where dinners could enjoy northern cuisine and listen to live music while dining. A current crackdown enforcing city coding laws for live music has a two-fold effect on La Carretería: the music has to be kept very low-key, and due to the limited number of small music venues in the city, Moguillansky has a constant stream of professional musicians practically begging to play in the restaurant for only the tips they receive passing the hat. Moguillansky and her trio, ‘Las Carreteras,’ featuring the restaurant owner on flute and two tango guitarists, sometimes play in the restaurant as well. Due to Argentina’s high inflation, La Carretaría’s famous tamales, frozen and shipped from Jujuy province are a bit pricey for the product. A better bet for an appetizer are the much larger and flavorful humitas, and the tasty country-style empanadas. While the restaurant’s dining area expanded, the kitchen is just a tad larger than before so the menu is usually limited to four dishes daily. Aside from the locro, popular are the guiso de lentejas, a lentil stew, stuffed peppers and dishes made with quinoa, a nutritious nutty grain that is a staple in Jujuy. Those looking to try a new dessert shouldn’t pass up the dulce de cayote (chayote, a type of prickly pear served in syrup). 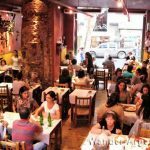 Moguillansky has faced more than her fair share of the problems that many family-run restaurants come up against in Buenos Aires – neoteric taxing schemes, shake-downs with every new city government, difficulty retaining wait staff and fussy neighbors. In spite of its popularity, it’s only through sheer force of will that Moguillansky has kept La Carretería open. This is a great place to come for a quick reasonably priced lunch, but after the sun goes down and the house vino tinto (red wine) is flowing from the penguin pitchers, La Carretería becomes very lively. Arrive early on weekend nights— the little blue house can fill up quickly, especially if word gets out that there will be live music.